From meeting the Beatles and recording albums with George Harrison in London to travelling throughout India and leading kirtans in front of thousands, Yamuna Devi also published a first-of- its-kind authentic vegetarian Indian cook book, which won top international awards. She had dedicated the last 45 years of her life to the worship of Lord Krishna and was a beloved member and well known figure of the Hare Krishna movement. WASHINGTON (December 21, 2011) – Yamuna Devi, a pioneer and influential early western convert of the Hare Krishna movement, the International Society for Krishna Consciousness (ISKCON), passed away early yesterday morning in Melbourne Beach, Florida. Born Joan Campanella, Yamuna Devi’s first encounter with ISKCON was in September of 1966 through her sister and it was then that she met with the movement’s founder, A.C. Bhaktivedanta Swami Srila Prabhupada. She soon became one of the first western adherents of India’s ancient Vaishnava, or devotional, culture and was given the name Yamuna devi dasi. Yamuna Devi is credited with being one of the most influential and inspiring voices during ISKCON’s fledgling years. The movement now boasts over 400 international temples, farm communities, restaurants and eco-villages. During a time when immigration laws opened up the opportunity for waves of South Asians to come to the West and assimilate with American culture, she embodied a unique voice that spoke of maintaining the values of the spiritual heritage of India. In August, 1968 Yamuna Devi along with her husband, Guru Dasa, and four other disciples of Srila Prabhupada broke new ground as they brought Hare Krishna culture to London, England. Still relative newcomers to the faith and tradition, they arrived in the United Kingdom with no financial or institutional support and only the hopes of introducing the worship of Lord Krishna to the British people. Despite the lack of resources, money and contacts, they achieved staggering success and eventually connected with the Beatles and struck a strong relationship with George Harrison. It was with Harrison that they soon descended upon the iconic Apple Studios, famous for churning out many albums for the Beatles, and recorded both the Hare Krishna mantra and the Govindam prayers, consisting of ancient Sanksrit verses. 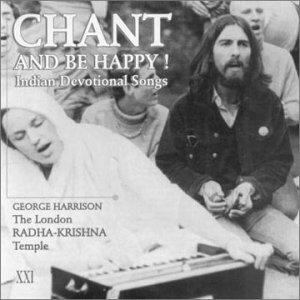 Yamuna Devi, a natural musician, led the vocals for the Govindam recording and the composition, produced and accompanied by Harrison himself, was released to the public and topped the European music charts along with the Hare Krishna chant. To this day, Yamuna Devi’s voice can be heard in every ISKCON temple during morning services when the Govindam bhajan is played for the deities of Radha and Krishna. Having also travelled to India with Srila Prabhupada during the Hare Krishna movement’s formative years, Yamuna Devi imbibed the culture of Krishna worship into her heart. She served as the personal cook for Srila Prabhupada for eight years which laid the foundation for what became her globally-recognized culinary abilities. She later published her own cookbook entitled, “Lord Krishna’s Cuisine: The Art of Indian Vegetarian Cooking” which garnered multiple awards, including the International Association of Culinary Professionals Cookbook of the Year. Spending recent years in Western Canada where she dedicated her efforts to promoting vegetarianism and environmental sustainability, Yamuna Devi eventually relocated to a Krishna community in Florida.